The National Park Service (NPS) recently awarded grants to 18 historically Black colleges and universities (HBCUs) totaling $8.6 million for projects to preserve historic structures on the institutions’ campuses. Campus projects focusing on pre-preservation studies, architectural plans and specifications, historic structure reports and the repair and rehabilitation of historic properties according to the Secretary of the Interior’s Standards for the Treatment of Historic Properties were eligible for HBCU Grant funding, according to NPS. Funding for NPS’ HBCU grant program comes through the Historic Preservation Fund, which supports preservation of HBCU campus sites that are listed among the National Register of Historic Places. HBCUs selected for preservation grants include Philander Smith College, Howard University, Delaware State University, Clark Atlanta University, Fort Valley State University, Harris-Stowe State University, Tougaloo College, Johnson C. Smith University, Livingstone College, Shaw University, Saint Augustine University, South Carolina State University, Voorhees College, Benedict College, Virginia Union University, Hampton University, Virginia State University and Virginia University of Lynchburg. South Carolina State University will use its grant to fund repairs to Wilkinson Hall. Howard University will focus on accessibility improvements to Founders Library on campus. 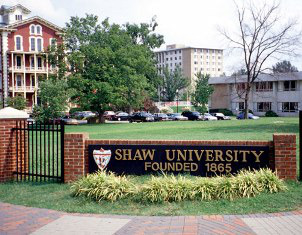 Shaw University received $480,000 to preserve Tupper Memorial Hall and Estey Hall located in Raleigh’s East Raleigh-South Park Historic District. “We are so excited to have the preservation funds to do much-needed rehabilitation to the building on our campus that bears the name of our Founder, Henry Martin Tupper and to preserve our iconic Estey Hall,” said Dr. Paulette Dillard, Shaw University’s interim president.